Last winter, I was working three jobs totaling 70 hours per week which left me tired and worn out. I had no desire to cook anything and I missed out on one of my favorite things to cook-Boston baked beans. These are the beans one has to start the night before, putting the beans out to soak, then get up at 5:00 a.m. and start preparing them so you can enjoy dinner at 6 or 7 p.m. These beans will make your house smell wonderful and homey, heat up your kitchen on cold wintery days, and fill you for a few days. What you do not eat freezes well, so you can enjoy them in the summer without your kitchen turning into a sauna! This recipe comes from the book “Best Recipes From the Backs of Boxes, Bottles, Cans and Jars” by Ceil Dyer and was found on Grandma’s Molasses label. Soak beans the night before. Rinse beans in cold water and drain. Place in large saucepan and add water. Bring to a boil and boil for 2 minutes. Remove from heat, cover loosely and let stand for 1 hour. Return to heat and bring to a boil, cover and simmer gently over low heat for 1 hour, until beans are tender. Drain beans and reserve liquid. 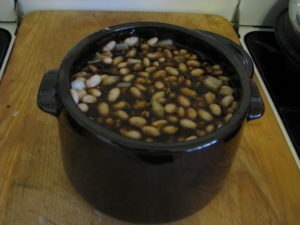 Turn beans into 2 1/2 quart bean pot or casserole; add onion and mix lightly. Cut through surface of salt pork every 1/2 inch, making cuts about 1 inch deep. Bury pork in beans. Mix 2 cups reserved bean liquid with molasses, salt and dry mustard; pour over beans. Cover and bake in 300 degree Fahrenheit oven for 5 to 6 hours. Check beans about once an hour and add additional bean liquid or water if the beans become dry; at the beginning of the cooking time the beans should be covered with liquid, and at the end of cooking the beans should be moist and coated with syrupy liquid. Makes 8 servings. I use my dark brown trusty bean pot for this recipe. This is a fabulous old-fashioned Yankee recipe. I like to add a little South to the meal and make some cornbread complete with honey butter. Fabulous! Boston Baked Beans in my trusty dark brown bean pot-fabulous weekend meal on a cold winter’s day!